Step 1 Raw fiber is received and is immediately weighed and catalogued. Step 2 Fiber is then prepared for cleaning. It is initially inspected by hand. To reduce cost, you are encouraged to inspect your fiber at home and remove any sticks or debris before shipment of dirty fiber. 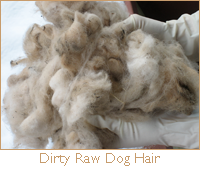 Step 3 Fiber is washed and deodorized using specialized methods, which prevent the occurrence of natural felting. Step 4 Once dry, the clean fiber is collected and carded using a manually operated drum carder in preparation for spinning. Step 5 A spinning wheel is used to hand spin the carded fiber to a selected thickness. 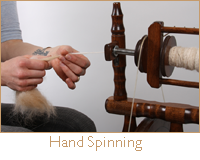 Two strands are spun and then plied together, producing 2-ply fiber. Step 6 A skein of fiber is made using a yarn swift. The fiber is washed a second time, weighted and hung to dry. Step 7 Now your fiber is ready for its intended purpose! 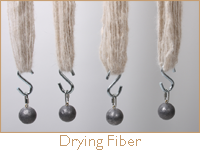 Weaving is a textile art in which two distinct sets of yarns are interlaced to create fabric. It can be a versatile and practical option when determining how to use your Chiengora. Woven Chiengora can be used to create scarves, wraps, blankets, throw pillows, and fabric for sewing projects. 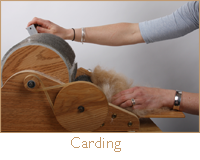 Step 1	Wool is measured using a warping mill to determine the warp, or size of any given weaving project. Step 2	That wool is then threaded through the floor loom in preparation for hand spun Chiengora to be incorporated. Step 3	Once the wool is secured in place, Chiengora is woven across the width of the warp to create an interlacing fabric. Step 4	When the weaving is completed, the Chiengora fabric is removed and the ends are tied off.